If you read the Great Debate of carpet versus hardwood and came out supporting Team Hardwood, you should know that there are even more great reasons to move ahead with the installation of your hardwood floors! From maintenance to money, there is a lot of support behind hardwood flooring being the perfect floor for you. At Crystal Carpet & Flooring Company, we have ten great reasons why hardwood floors will be the best decision you make all year. Easy to Clean: Hardwood flooring is incredibly easy to clean with just a broom and dustpan for typical weekly messes! Regular mopping removes dirt or mud tracked inside the house, but for the most part hardwood floors don’t attract enough dirt to warrant heavy cleaning. Easy to Maintain: Hardwood floors can last for decades if properly maintained. All you need are wood cleaning spray, floor polish, and a mop specifically designed for wood floors. Hygienic: Unlike carpet, which can trap allergens, dust mites, and dirt, hardwood floors are remarkably hygienic. If you have pets in your home, it’s wise to consider flooring that won’t trap dander between the fibers. Long Lasting: Hardwood floors last longer than carpet, tile, and vinyl. Some houses still have beautiful hardwood floors that are over a hundred years old! Refinished vs Replaced: If your hardwood floor does start to see some wear and tear, you can always refinish it. This is much cheaper than replacing the floor, which you have to do every few years with carpet. 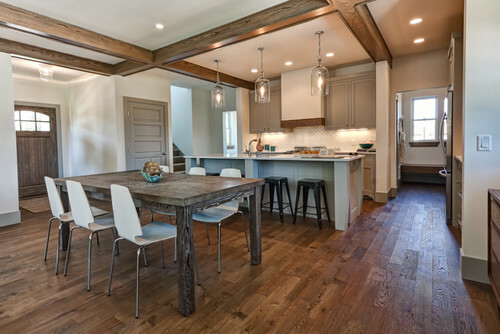 High Quality: Hardwood flooring looks elegant and high-end no matter the house. Also, houses with hardwood floors typically sell faster than those with other types of flooring because of the high quality appearance. Aesthetically Pleasing: Unlike carpet and tile which can go out of style (remember orange shag carpets? ), hardwood floors are timeless. They are aesthetically pleasing no matter the decade, and will no doubt keep up with future design trends for the next hundred years. Warmth: A light hardwood floor can brighten a space immensely and is warmer than tile in those cold winter months. Darker floors pair nicely with white furniture for a sleek, modern look that also feels inviting and comfortable. Cost Effective: Hardwood floors are remarkably cost effective. Since they’re longer lasting, you spend less money over time maintaining the floors than you would with others like carpet or tile. They also cut costs in just about every other area, from cleaning to replacing! Unlimited Options: With the range of available colors, treatments, and types of wood, there are almost unlimited options for your next hardwood floor. At Crystal Carpet & Flooring, we’re excited to help you cheer on Team Hardwood! To settle the Great Debate once and for all, head to our showroom in Wilmington, NC to find the hardwood flooring that’s perfect for you.